When the slab serif was launched in Britain, it led to amazing way of advertising. Many individuals and companies choose to use this font to advertise on billboards, posters and pamphlets. Today, slab serif fonts are designed for long stretched of texts and still used by advertisers looking for a type of font that stands out of the crowd. What are Slab serif fonts? In typography, these fonts are also known as Egyptian, antique or Square serif and can evoke ranges of feelings. Some slabs are put in Clarendon style can seem like Old West font, while other slabs based on geometric models can bring forth a contemporary feel. Most of the time, slab serifs are used to display texts but they can work well for setting body text. Slab serif is a type of serif typeface which is characterized by thick block- like serifs. Slabs serifs such as Rockwell have a geometric design with limited variation in stroke width. This design plus others are termed as serifs that increase width along their length prior merging with main strokes of letter. Here are 14 most popular slab serif fonts. This is the perfect font for anyone looking for a slab serif that thrives in text. It’s an eye-catching font whose capital O is an excellent circle known as Geometric and the capital H have horizontal and vertical strokes. 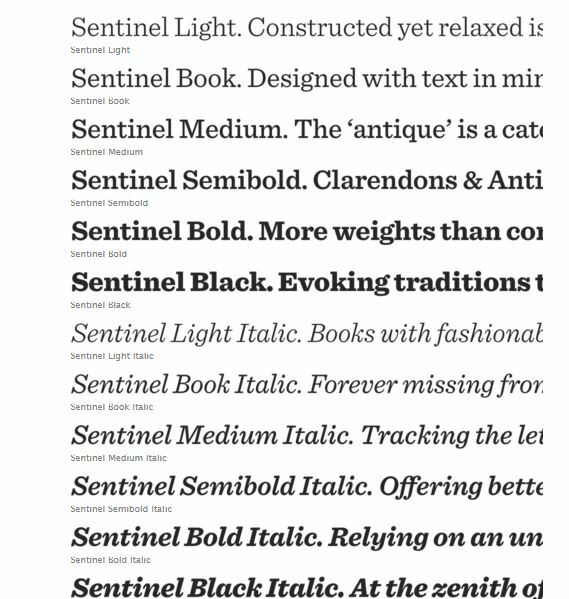 Sentinel is designed to address various shortcomings of the classical slab serif. Arvo font is a geometric slab serif typeface family perfect for print and screen. It features four cuts; bold italic, roman bold, italic and roman. This font is open and it’s distributed through the Google Font directory. The font is mixed; monolinearish and has a bit of contrast. This contemporary slab serif text is designed for reading on any computer or device. The font combines large X heights and subtle characters that provide a certain rhythm to flowing texts. Bitter has a small variation in stroke weight and the regular is thicker than a normal style for print design. All the glyphs are well designed with a perfect curve quality added to the first stage of the design. Bodonitown font is a regular font style. This font is a basic serif font designed by Manfred Klein. You can find this font free and use it for both personal and commercial usage. If you want to make a difference in your graphic design, illustration project or web design, this is the ideal font for you. The font comes formatted for graphic design software and publishing software like adobe Photoshop, Microsoft for Windows and Mac, Adobe In design and Adobe Illustrator. Chunkfive is an ultra bold slab serif typeface that is an inspiration of Old American Western woodcuts, newspaper headlines and broadsides. If you are searching for a font that stands out, this is the font to use. This font is used for display and the fat block lettering is unreserved and refined for contemporary use. Josefin Slab is a font that follows the 1930s trend of geometric typefaces. The font seems to be in between Kabel and Memphis with modern details. The font also has a typewriter style attributes and gothic letter typeface. Indento is a multi-purpose modern geometric slab serif for headlines, posters, branding but fairly legible to be used as longer text. The straight and rounded corners combined with deep cuts and asymmetric serifs give it a distinctive look while still keeping its rigorousness and legibility. The family consists of three weights, each with a companying italic. The extensive character set—513 glyphs in each font—includes support for Central and Eastern European languages and OpenType features like small caps, ligatures, fractions, slashed zero, stylistic alternates and more. This is a new font by Heybing Supply Co. This new slab serif font has strong and unique shapes and can handle a lot of design styles. The font has a retro, vintage feel and simple characters. Burton Slab Typeface features set of capital and lowercase letters, punctuations, numerals, multilingual support and currency figures among others. This modern slab serif includes two individual weights. It’s an ideal choice for applications, magazines, flyers and can be used as a WebFont. 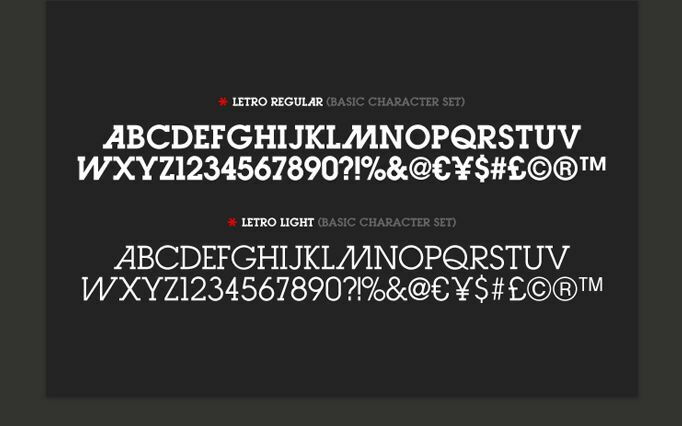 Letro has a modern geometric slab that which seems to look like early Swiss sans serif and slab serif typefaces. This font has both regular and light weights and supports over 25 languages. Kontrapunkt is an attractive, elegant and free slab style font designed by a branding agency in Osaka and Denmark. The font has smooth lines, fullness of form and some unique styling on some of the letter forms. This font supports a wide range of languages and it a complete opentype typeface font. The total weight counts to 455 glyphs. Museo slab features 12 styles which includes 100 ( Italic), 300 ( Italic), 500 ( Italic), 700 ( Italic), 900 ( Italic) and a new 1000 weight ( Italic). However, Museo Slab 500 and Museo Slab 500 Italic are free. Nadia is a modern imitation of Granjon Old Style. It is characterized by large elongated serifs and big proportion and a large X height. 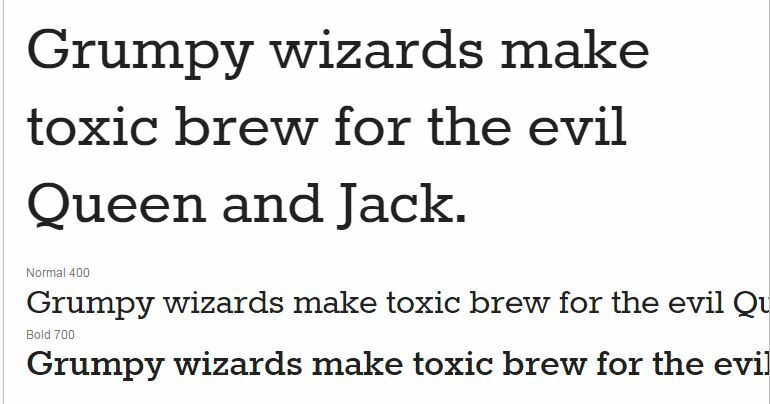 This font elegantly displays headlines as well as text. Nadia font has a unique vibrant and high quality which can call sensuous. The font is truly unique characterized by clean, rounded shapes and crisp. This font is inspired by the type of forms of a number of unique geometric slab serif at times called Egyptian. Rokkitt is designed as a display font for headings and headlines but it can be used as an alternative to sans serif text fonts. These are some of the best slab serif fonts you can download online free. Thanks to these fonts, you will be able to take your graphic designing and advertising to the next level.